There's a nice diversity of rc aircraft types within the radio control flying hobby, so you're bound to find something to suit your taste and needs. This page will outline various types, and you can click through to read more about them on other pages. Remember that the word aircraft covers all flying machines, not just conventional airplanes. Also bear in mind that the most common rc aircraft types (airplanes and helicopters) can be scale, semi-scale and non-scale models. These three terms refer to the reality of the model; whether it replicates a real aircraft (scale), is a close representation of a real aircraft (semi-scale) or is a completely made-up design (non-scale). Whether you end up flying scale, semi-scale or non-scale rc aircraft comes down to your own personal preference. There are plenty from each category to choose from these days, a reflection of the popularity of the hobby! For the purpose of this page, rc airplanes and helicopters have been split in to their own groups; simply categorising them as just two different aircraft types would be a bit broad given the variations available. Collectively, rc planes account for the largest number of aircraft in the hobby. Having said that, the popularity of flying rc helicopters has grown tremendously in recent years as electric rc helicopters have surged onto the scene, and the gap between the number of rc airplane pilots and rc helicopter pilots has become much smaller than it ever has been. Even more recently, multicopters or drones have amassed huge sales globally as this newest sector of the radio control flying hobby takes hold. Trainer airplanes, or 'trainers', are designed for learning on. They are conventional in design and basic, with the wing on top of the fuselage for maximum stability in the air. Trainers can be powered by electric motor or internal combustion engine, glow plug (nitro) being the most common of the IC group. Trainers are available in many different sizes and shapes and count for a large sector of all rc aircraft. Ideally your first rc plane will be a trainer. Read more on rc trainer planes. Sport airplanes also make up a very large sector of all rc planes. They are the next step up from a trainer but can also be used for training purposes, particularly low-wing training. Sport airplanes can be any size or shape and are more capable of performing aerobatic maneuvers than trainers are. The majority of sport planes are mid or low wing, making them better for performing such maneuvers. High wing planes like trainers, generally speaking, are not that aerobatic. Aerobatic airplanes have been designed specifically for performing advanced aerobatic maneuvers and '3D' flying. This type of rc airplane is typically mid wing with oversize control surfaces and motors (electric or IC) that deliver more power than the airplane actually needs. Aerobatic airplanes can be thrown around the sky and flown very aggressively, so long as the pilot knows what he or she is doing! Read more on rc aerobatic airplanes. Warbirds have always been a popular rc aircraft subject; their classic lines and smooth flying characteristics make warbirds some of the nicest looking rc airplanes out there. The term warbird describes a wartime plane, notably from the First and particularly Second World War. The P-51 Mustang, Spitfire and Corsair F4U are classic examples. Not particularly suitable as an absolute first rc plane, although there are some RTF warbirds available that have been developed with the beginner in mind. Read more on rc warbirds. Vintage rc airplanes are also a popular subject, particularly with modellers who enjoy the traditional building side of the hobby as well as the flying side. Many classic designs date back to the late 1930s and 40s and are large in size. 3-channel radio and a 4-stroke engine make the best combination in vintage airplanes, and they are often slow, gentle flyers. Vintage planes are also known as Old Timers in some parts of the world, and you might also see them referred to as planes from the 'Golden Era' of aeromodelling. Read more on vintage rc airplanes. Read more about rc floatplanes. Single rotor helicopters count for a huge sector of the rc flying hobby. Like airplanes, they can be electric or IC powered. Electric helicopters have become very popular in recent years and some are easier to fly than others. IC helicopters are slightly more complicated because of the engine and clutch assembly. Learning to fly a multi-channel IC rc helicopter is a serious business, but ultimately very rewarding. Of course, the larger size (eg 700) electric rc helicopters are just as complex as IC ones, apart from the motor side of things, and can be just as expensive too. Read more on electric rc helicopters. Coaxial rc helicopters are sometimes called contra-rotating or dual rotor helicopters. They have two main rotors, mounted one above the other, that spin in opposite directions to each other. This cancels out the torque force normally generated by a spinning single rotor, and so a tail rotor isn't required to counter any torque. This makes coaxial rc helicopters easier to fly and often more stable than a conventional helicopter. Many beginner helicopters are coaxial. Jets can be powered by electric or glow plug ducted fan or miniature gas turbine engines. The gas turbine powered jets require a lot of flying experience and a big budget - the engine alone can cost a couple of thousand dollars. Ultimately, though, scale jets like these look very impressive both on the ground and in the air, and sound just like the real thing too. Electric ducted fan (EDF) rc jets have become hugely popular in recent years, with foam models widely available. Not really for the beginner, although there are some 'beginner friendly' ones out there. Read more on rc jets. Gliders are aircraft without motors. They are the simplest form of airplane and require the least number of accessories. With an rc glider you have to rely solely on the wind and/or thermals to keep the aircraft airborne. Flying from a slope is a popular way of rc gliding, and there are several methods of launch for flying from a flat field. Read more on rc gliders. Powered gliders, also called e-soarers, are essentially gliders with electric motors. The propeller blades fold back when the motor is not in use, flat against the nose of the plane to reduce drag. Most powered gliders have the motor in the nose, but they can also have the motor on a fold-away pod on top of the fuselage, behind the wing. Read more on rc powered gliders. Blimps are electric powered airships. They vary in design, but all have one thing in common - a helium filled body under which hangs the cabin and motors. The best rc blimps have two or three motors that tilt up and down to control the altitude of the blimp, and rotate to control directional movement. RC blimps are only suitable for flying indoors, or outside on a completely calm day. Read more on rc blimps. Multicopters, or drones, are relatively new to the radio control flying hobby and feature three or more electric motors on booms coming out of a central hub or fuselage. These 'copters are very stable and also agile, and make excellent camera platforms. 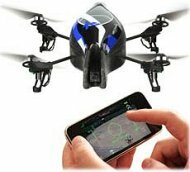 RC multicopters are also sometimes sold as 'RC UFOs' but the term multicopter has become more common in recent years, with tricopters (3 motors) and quadcopters (4 motors) being the most common. Toy rc UFOs are also available, though usually with a single motor surrounded by an outer foam body. Read more on rc multicopters / drones. Autogyros are fairly uncommon and unconventional rc aircraft, but the release in 2012 of a foam electric powered plug and play autogyro has introduced them to otherwise 'non-rotary' flyers. Somewhere between a plane and a helicopter, an rc autogyro is a great addition to any aeromodeller's collection. If you want a different kind of radio control experience, get one of these! Read more on rc autogyros. Ornithopters are aircraft that represent birds. True to the real thing, ornithopters are powered through the air by the flapping motion of the wings, and can look very convincing when in flight. There aren't a huge number available to buy and are not really that popular with serious rc flyers, but are good fun anyway! Novelty rc aircraft can cover just about anything that isn't considered to be a conventional rc aircraft. The reality is that almost anything can be made to fly if it has the right design properties - rc flying lawn mowers, witches on sticks and flags are just some examples. These are true 'novelty aircraft' and there are several manufacturers who specialise in this kind of rc aircraft for the non-serious modeller. Whatever your preference, there are many rc aircraft types available these days and there's sure to be something to suit your needs. If you have access to an rc flight simulator you can try your hand at flying many different aircraft types without actually having to buy any! Flying rc aircraft of any type is an exhilarating and addictive hobby, and one that will give you much satisfaction - guaranteed!